Customer service, document management and workflow, and efficient technology are the top factors that make a business great. If any of these aspects is subpar, the entire business can suffer, resulting in financial problems or worse. Fortunately, these top factors seem to run into each other, and they all come down to one thing: office organization. When organization is on point, the whole business comes together, and Caltronics is here to help businesses streamline their offices with the help of cutting edge products, technology, and professional advice. Network Fax System: This solution helps businesses to cut the costs of traditional fax machines by offering the Captaris RightFax as a paperless fax option. This product does away with the need for managing individual fax hardware and software and, instead, creates a move to centralized, secure faxing. Document Management and Scanning Solutions: Caltronics offers everything from basic desktop scanners and scanning to complete Enterprise Document Management. The Caltronics Solutions Team is well trained to help businesses transition into paperless environments. Workflow Solutions: The biggest source of clutter in any office building is managing and moving paper documents between departments and individuals. Things can get lost, ruined, or otherwise misplaced, making paper documents more of a problem than a solution. Caltronics offers electronic workflow options to help streamline offices and make them more efficient. With the help of “virtual” inbox and outbox solutions, businesses are able keep track of documents as well as distribute them between departments and customers with ease. The mentioned services from Caltronics can help improve a company’s customer service, document management, and workflow in a snap by keeping the company totally organized. Their products, services, and solutions are designed to make things easier and better for each aspect of a business. Visit caltronics.net website to learn even more. This entry was posted in Uncategorized and tagged Caltronics, Scanning Solutions on August 26, 2015 by riehlt. Anyone who works in an office has gotten that feeling of tedium that occurs a few hours after lunch. Watching the clock and staring at a computer screen isn’t going to make time go any faster, nor will it make you productive. Get some fresh air to help stimulate your brain. Whether it’s just sitting next to a window or, if possible, stepping out of the office for a few seconds, the sunlight and fresh air will almost certainly give you the necessary boost of energy. Take a walk around the office to get your blood flowing. Sitting for too long can be mind-numbing. Simply getting up and walking to the water cooler or the copy room and back will help you refocus on the present tasks. Use the 20-20-20 rule to break the monotony of computer screens. Every 20 minutes of staring at the screen, look away at something 20 feet away for 20 seconds. Sometimes you may not have time to get up and walk around, or you get so focused on a task that you don’t realize your eyes have been aching. This rule helps make sure that your eyes won’t experience as much pain and fatigue as they would otherwise. This helps the rest of you keep up with the task at hand. Listen to some music to regain focus and wake yourself up. This will take some personalization and trial and error. Some people can’t focus at all when they listen to music. Others listen to something with no words (classical or instrumental rock), while others like listening to top-40 on the job. Experiment with different types of music to figure out what gets your blood flowing and refocuses you. Eat a healthy snack for a nice boost. Almonds and other nuts are popular for naturally enhancing your energy, along with fruits and their natural sugars. 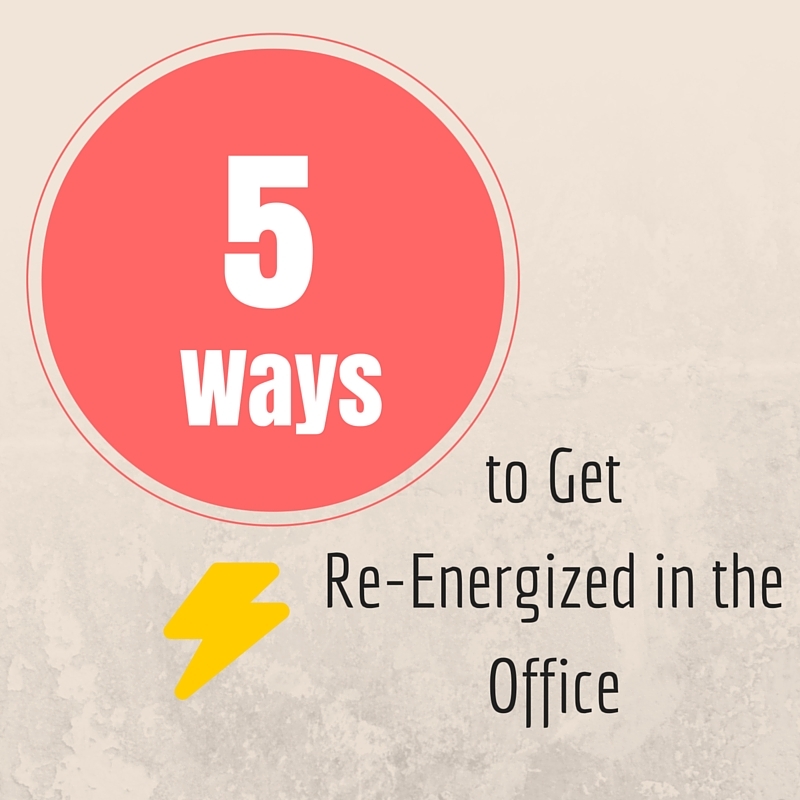 Not only will this help keep you energized, but it’s also a good habit for health reasons. Switching out the chips and soda for almonds and fruit will help you feel better in countless ways. If all else fails, use the tried-and-true method of drinking some extra caffeine for a temporary boost. Only do this as a last resort, as you will inevitably crash again. However, if you follow the 20-20-20 rule, have some healthy snacks at hand, and give yourself short breaks, you shouldn’t need to resort to a 2:30 coffee break to make it through your day. This entry was posted in Uncategorized on August 21, 2015 by riehlt. If you’re looking for a new copier, and therefore, a copier dealer, the amount of options and considerations can be overwhelming. Plenty of dealers will say they have the best prices or have just what you need, but is that always the case? When looking for a copier dealer, three fundamental things you should look for is how up-to-date their hardware is, how well they’re able to fit your needs, and how good their customer service is. All copiers and printers aren’t the same. While you may not need the newest model of copiers that have loads of extra applications, having a print environment with the most up-to-date products will ensure that your office will increase its efficiency. They will be more reliable as well. 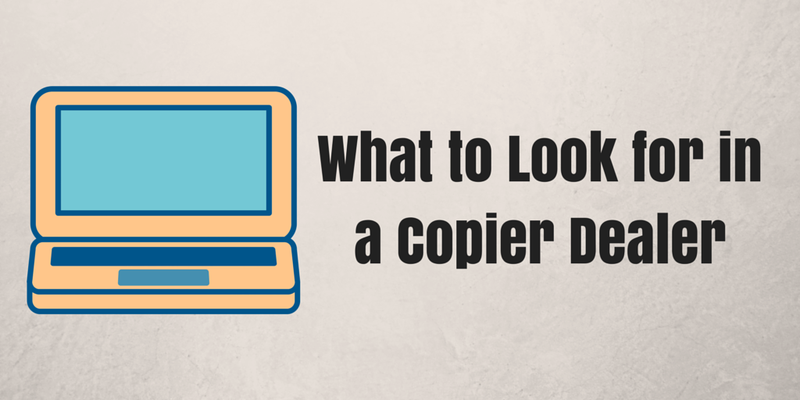 It could be cheaper initially to go with copier dealers who are offering older equipment. While this may be an option for cash-strapped startups, the long-term benefits, financial and otherwise, of finding a dealer with the most current technology will be well worth it. Each office has very unique needs, and you want to find a copier dealer that takes these needs into consideration. A smaller office might not need anything more than the most efficient copier and printer systems. On the other hand, a large office that does a lot of commercial printing will need substantially larger machines and more functions. Having a variety of options can be just as important as having the best equipment when it comes to cost and satisfaction. A good copier dealer won’t just try to sell you the most expensive unit or whatever they have on hand. They should discuss the different options with you, understand your needs, and help you come to the best decision for YOUR business. Your contract with the copier dealer does not end when the equipment arrives at your office. You’ll inevitably have questions or potential issues with your copier and printer, and you need to be able to rely on the copier dealer to help you. Ask friends and business associates about their experiences and make sure that a pleasant experience with the sales associates will continue to be pleasant once you’ve signed a contract. Caltronics Business Systems offers a large variety of ways to manage your workflow, including the most technologically advanced and economical hardware from Konica Minolta and HP. And as Konica Minolta Pro-Tech Service Award recipients for nearly a decade, you can be assured that Caltronics will be able to answer any questions you may have and give prompt and accurate technical assistance when you need it. This entry was posted in Uncategorized on August 10, 2015 by riehlt.